During last Tuesday’s State of the Union Address, President Obama said, “Every dollar we invest in high-quality early childhood education can save more than seven dollars later on – by boosting graduation rates, reducing teen pregnancy, even reducing violent crime.” Of course, Obama’s emphasis on early education is not new but rather a reiteration of Obama’s previous push for more funding to provide pre-kindergarten education for every four-year-old in America. Research stands behind the importance of pre-k education. Investments in early education are believed to raise long-term skill levels, increase graduation rates, create jobs, reduce the stress on low-income parents and reduce crime and poverty. I spoke with a current early childhood professional who concurs, stating that preschool provides a space where kids “learn how to learn.” Before the structured academics that children receive from their educational journeys, preschool teaches kids how to behave in school, get into a routine, and socialize with others. Learning how to be one child in a group full of fifteen, twenty or twenty five others is not an easy thing to learn, and must be introduced to children at an early age. Over the past year, many states across the country expanded or created preschool programs, including Minnesota, Michigan, Montana, and Alabama. Republican Governor Rick Snyder of Michigan believes that this policy move is important because preschool is “a human need and an economic need,” and proceeded to increase spending by $65 million last year. 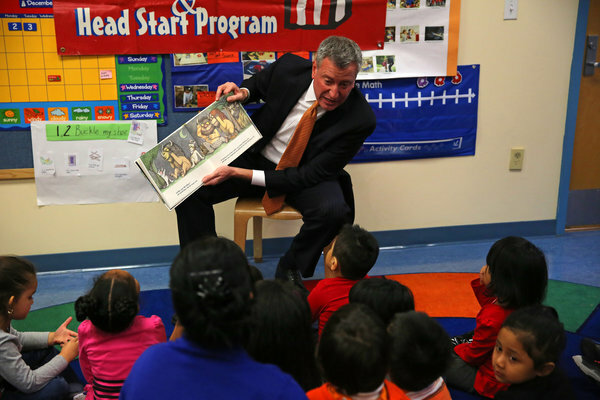 Additionally, Bill de Blasio was elected mayor in New York City on the promise of universal prekindergarten education for all city residents. In a recent interview with Jon Stewart, de Blasio spoke of his five-year, $2.6 billion dollar plan to provide full day pre-k for every child in the city. Based on research and recent state legislation, it seems that the country is in general agreement that preschool for children is necessary for the further development and success of the nation. However, this is not such a beautiful picture in Washington D.C. In Congress, Republicans have opposed Obama’s $75 billion investment in preschool, stating that the policy is too top-down and should instead be the responsibility of local communities and state governments. I think that Republicans in general are resistant to new social programs that Obama proposes, using this as an example to generate opposition. Mandatory pre-k education seems to be a bipartisan cause, but remains divided in our nation’s capital. I find it ironic that Republican and Democratic centered governments alike are on board for preschool policy changes, but that this issue cannot come to fruition in Washington. The way I see it, members of Congress simply want to continue to disagree with social policies, regardless of the good that they imply. Of course, an issue as such always comes back to a question of funding. The New York Times sites many ways that states are planning to cover preschool, ranging from sales tax increases to legalizing marijuana to casino revenue. However, it remains unclear how to pay for universal access to preschool education. Could it be that politicians are simply preaching preschool to attract voters? In particular, these policy changes would attract the working class and women, which are demographics that many politicians need to charm. Is this a policy move, or more of a political power move? Growing up in what I consider to be a privileged community, preschool education is taken for granted. It is a given that parents will pay for their kids to go to preschool so that they can work, as it was unusual for my friends to have stay at home parents. Part of the reason that this issue is so highly debated in Washington is because high-income districts can afford preschool funding while lower-income districts would have a harder time enforcing this type of policy. Given the importance of preschool education, it is my hope that funding will move toward city/state/local authorities rather than fall on the responsibility of private incomes, with a focus in problem solving for those lower income areas. I think that the United States has been criticized enough for our faulty education system. This should be one step that policy makers need to put on their priority list – a seemingly simple step that can set up great future success for a nation. While this is a hot issue right now in national news, it has major global implications. If the United States is a global leader, the policy decisions that we make will be under close surveillance by the rest of the world. Whether this preschool policy shift will bring more success to the U.S. is yet to be determined, but it does have the potential to change some negative perceptions of our education system. I do think that these changes will come from more state and local authorities, as those in Washington continuously seek power over policy. I will forever be a firm believer in preschool education, and hope to see it promoted and enforced by these more localized authorities in the next few years.